I'm looking at getting a new airfilter rather than cleaning my old one. I came across a K&N claiming high flow rates. I'm wondering if the Jetronic depends on a certain flowrate contributed to by the resistance from the airfilter, and so swapping in a high flow rate filter will screw up the FI system? Does anyone have any experience with changing to K&N? I recall having seen elsewhere on the net that oiled fabric filters let more dirt into the engine than the BMW filter. With regard to air flow efficiency if you have access to a rolling road try a test by measuring engine performance with the BMW filter and without any filter (to give no restriction to air flow), I recall reading that was done on a K bike and there was no surge in power with no filter so it is hard to see how another brand of filter could increase power. The filter is changed every 15,000 K or every 9,000 miles (every 10,000K or 6000 miles in very dusty conditions). As it gets changed relatively infrequently why go with reduced filtration efficiency is my thoughts, I believe the cost advantage is outweighed by the potential increased level of wear. But that's my personal opinion and what I choose to do, YMMV as they say. When you change a critical element of engine protection, be it air filtration, fuel filtration, oil filtration or type of oil itself, the change may be beneficial or it may be detrimental you pays your money and you takes your chances. I use the 'paper' BMW air filter. It's such a contentious issue, this one. Having worked with a mob of bike racers, engineer-types, and general revhead loonies at a large BMW shop, and listening to them rabbit on about how much sand they'd have to clean from inside of customer's K-bike airboxes when using K&N air filters put me off the brand. One knowledgeable mechanic, Fred, would call the other techs round, and whomever was passing through the workshop at the time, and admonish us all about the effects of dirt particles inside of our engines due to a crap air filter. Then he'd belt out a hearty laugh. The common theme was that the rubberised frame of the K&N was not pliable enough to properly seal. A bead of grease was talked about as a halfway measure of keeping the grit at bay. In the end they all agreed that the factory filter did the intended job and they'd seen no measurable change in performance when dyno-ing theirs or our customer's bikes, in particular with early K-bikes. I reckon it's the clean and reuse quality of the brand, and a good dose of marketing, that keeps them selling all these years. To my mind you cannot beat the advice of a guy who has been there-done that and owns the T shirt to prove it. Good to have you share that experience with us TWB. Well I don't want to reduce the filtration thats for sure. I'll go with a new OE part then. Thanks for the info. You Guys worry far too much. ...[img][/img].13K miles and still going strong. Got any other views of that gem, Beachcomber? this is "work in progress". The pix are are obviously before the project was fully mocked up [ no front guard, no upholstery / paint. Also it is rolling on the "slave " wheels. I subsequently fitted K1100RS 3 spokers, but the rear still looked too narrow - so I'm busy fitting 5 spoke Wobblies from a K1200 [ 5.5" rear instead of 4.5"] . The bike has run for 13K miles with the small chrome / gauze filter on the intake and NO filter in the box. The air box now acts as a plenum - nothing else. Next week I hope to have the 5 spokers fitted and the "odds" finalised. Then it's a strip down for paint/powder coating/detailing and upholstery. Coulourways will be Satin Black with FO Orange wheels and highlights - if I get time, then the frame will be Orange too. All the plastics will be painted in a new Black wrinkle paint we came across. I enjoy a good garage project myself, having cut a few unnecessary bits off various bikes of mine over the years. 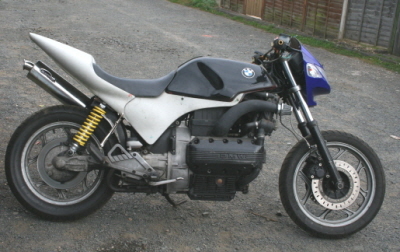 On a stripped-down R1100RS I cobbled together from a donor GS and another RS I removed the airbox entirely and substituted 150mm long Uni-brand oiled foam pods clamped to the intake sleeves. Coupled with an open BMP exhaust, no catalyser and some mild head & port work, she sounded the part, but more importantly she went too. The best part was ejecting nearly 35 kilos(!) of excess weight from her girth. I used her successfully at track days and on quick weekend blasts to nowhere. An errant Honda Civic driver yakking on his mobile hit me head-on one night. She lay in the street gurgling hot oil from a cracked block like blood from a slaughtered cow. I nearly cried but for the wincing pain from three broken ribs. This one of yours looks the go. I'll be interested to see the finished project. Please do share. Thanks for that. One of the key weight loss projects for many persons of more advanced years is personal weight loss, far more significant than trimming a bit off the bike. But if one does both it would make a huge difference not the least to the speed and agility with which one could move around on the bike as well as the acceleration of the combined rider plus bike. Agreed, 176cm & about 85 kilos in my gear works for me! MotoGP, WSBK and other top-level riders are often flyweights. Dani Pedrosa, for example, stands at 5'4" and is under 115 pounds (53 kilos) during the season. Regrettably as I'm aiming for something approaching a 100lbs weight saving [ bike ] - to do the same with my body would neccesitate removing an arm or a leg or two! Although I have just reached the age of 66 [ just a number ], I have always been quite active and was playing American Football [ Centre ] for a top UK team at the age of 55. Yes I've put on the odd pound or 6 since I stopped playing / training AND maybe I could afford to lose 15 - 20 lbs, but far less painful to remove the weight from the bike. HOWEVER - all that said, I never declared an interest to go faster / be more lithe around the bike. I am an automotive design engineer [ semi-retired] and my prime interest is taking something stock - and changing it / improving it / whatever. I've been a lifelong Special builder / Hot Rodder. I also like the challenge of doing the above to something well, not considered suitable for the job - eg K100/1100. Not so long ago a similarly ageing pal of mine bought a tricked out 1200 Bandit with all the bells and whistles. We went out for a Sunday bimble to Stratford on Avon, where it was my bike [ Mk2 version ] that got all the attention. My bike cost a fraction of his - AND was just as much fun to ride and yes - show off. Ahhhhgggg - read all the posts properly before responding. TWB - yes I saw a similar arrangement on a US Kay [ 1100RS ] - and although I was originally a bit nervous of "tampering" with the Motronic set up, several people appear to have changed elements of the system [ exhaust system / intake / cams ] without the dire results many of the experts had predicted. I plan to make a similar plenum arrangement on the Race Rep [ K1100RS ] project and ditch the airbox completely. When I had a K1200S (which I deeply regret selling - moved back across the big blue ocean) I fitted the excellent, Italian-made BMC air filters into her. I managed 38,000 miles in under 18 months on that fine motorbike from August '05 through January/February '07. I rode to the tip of Baja, Mexico, Western Canada and all of the American Southwest, plus back and forth to and from my job at a BMW shop almost every day. I had originally fitted an aluminium Leo Vince canister but changed to an alu Remus (much better build quality) and the intake and exhaust mods combined with no other changes, gave the bike another four horsepower at the rear wheel on the Dyno, with no dips in the curve of either torque or caballos (ponies). The upgrade for the K1200R (and the K1300R) is a dual air filter kit from Evoluzione Cyclesport, from somewhere in Calithumpia. They come with a single filter only from the factory. We Dyno'd one with just the air filters, then with a Remus Powercone and the air filter upgrade, and then with the 'Rapid' Module from Italy. The air filter upgrade alone made the most power, measured singularly. So, freer-flowing air filters can make a difference. More air in, but also more air out. The engine is, as you know, simply a pump. Having it be clean air over the long-term is what we are seeking. You see that's what I love about these forums !!! TWB - you have confirmed what I already thought - but the "experts" kept doomsaying. You CAN change elements of the system [ intake / exhaust ] WITHOUT having to remap. AND, from your results you CAN expect and improvement. 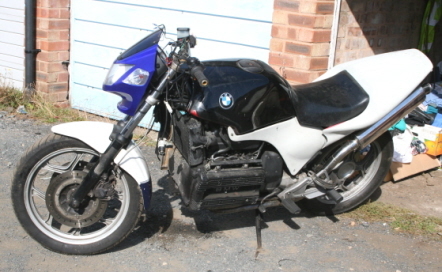 I accidentally started my K1100LT [ don't ask ] without ANY exhast at all - started , revved well and then idled. I know that Jetronic is no problem as it's basically the same as my old Beemer cars I used to play with. I started [ deliberately this time ] my K100 Streetfighter project with the upswept pipe in place , but initially with no silencer ! For no other reason than I wanted to hear what it sounded like. Again revved and ran perfectly. Then with can fitted - it had a bit of a racing Duke sound to it. But the K100 filter is massive and I know I have read people have run with no filter, stock filter and hugely expensive rock filter from K&N and no difference in power. Also as TWB said dust gets through the oiled filter, given they don't improve performance are worse at filtration & look awful my overriding thought is why do it? Ever notice when you rock up to a BMW-specific rally, set up your tent, grab a coldie and have a good wander through the bikes, saying the usual hello's to your fellow moto-headcases, that there are hardly any 'stock' motorbikes? That's the beauty of it; you can change it to suit yourself. Some mods are good, some not so. But it's yours to ride and experiment with. If the depth of your mechanical skills and interests are meagre, or your purse strings are tight, either leave it to someone else to mod for you, or ride it the way the Teutons intended. Como Dios manda! Spot on TWB - my sentiments exactly. There's no such thing as the perfect factory bike - and in my view, they form a platform to "do your own thing". I would suspect that virtually EVERY BMW out there has been "customised". Now then before we get loads of harrrumphing - customsing can be anything from fitting aftermarket panniers / heated grips / SatNav - to a full on Cafe Racer, Streetfighter or whatever. We're ALL customisers, it's just the degree in which we differ. While recently looking in dark corners of the interwebtron for some info on an aftermarket dual air cleaner kit for K12/K13 series I discovered this thread. The 'guest' replying is me as I took some time off the forum for a while and when I re-signed my original designation was gone. Anywhoo, there are two folks here who I rather enjoyed 'chatting' with and who some others of you might miss also. I know we have not heard a hide nor hair from K-Bike in yonks but does anyone know where old 'Comber went? Recently fitted RAMAIR L Jetronic filter conversion to the trike, have to mod it slightly redrilled mounting screw holes and on faired bikes not sure if the filter will fit, but as the filter is cloth/foam covering a stainless cage a little shape manipulation should be possible. This plus four straight through equal length pipes slightly longer than standard silencer it goes like stink, a vast improvement in acceleration over standard.